Subway’s featured sub of the month is the Buffalo Chicken sandwich. This saucy sub has a little kick to it but its still mild enough for mainstream America. As I’ve mentioned before, I find it odd how the sub is listed on the Subway Nutritional guidelines, so I will help de-mystify the healthful-ness of it. 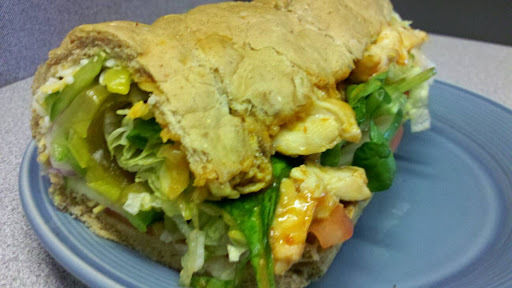 6″ Buffalo Chicken (with regular Ranch dressing) includes 9-grain wheat bread, lettuce, tomatoes, onions, green peppers and cucumbers. Add lots of veggies. Adding vegetables provides you not only your recommended vegetable intake for the day, but does so with minimal burdern on your nutrional categories of calories/fat/carb/protein. Personally, I enjoy lots of vegetables on this sandwich because it can provide a crisp, cool contrast to the buffalo sauce. The other added benefit is that vegetables will help fill you up. Why not split it into 2 meals or share your lunch with a friend! Omit the cheese. Pinching your calories even more? Doing so will save you an extra 40 calories per 6-inch, or 80 in the footlong version. I assume the history of buffalo chicken sandwiches can somehow be traced back to the origin of the buffalo chicken wing. If that is where the buffalo sandwich takes your mind too, perhaps skip the cheese and enjoy your favorite light beer in it’s place. Take this sandwich home, sit on your back porch and enjoy the buffalo and beer. Summer’s almost over. How does this stack up against the other $5 footlongs of Summer 2011? If the regular ranch dressing is omitted from this month’s Buffalo Chicken, then this sub is actually better for you than it’s two predecessors – June: Chipotle Chicken and Cheese and July: Italian B.M.T.(R). However, it matches up well to my favorite thus far, the Orchard Chicken Salad sandwich from May. The Buffalo Chicken has a slight edge on calories, but doesn’t compare to the bright summer flavors of the orchard chicken salad. Next up in the month of September: Turkey Breast and Black Forest Ham.